This is just me, but it looks for all the world as though another noted athletic figure is about to be shown the door. 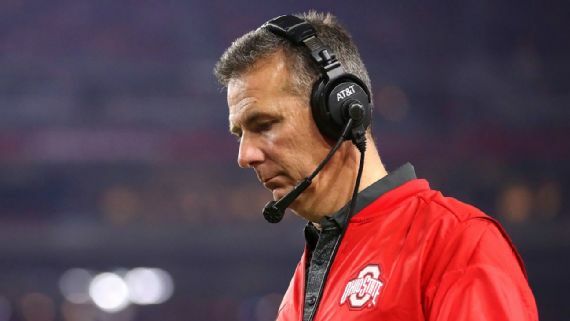 Ohio State University head football coach Urban Meyer is now on “administrative leave” while the school — using an outside investigative firm — looks into allegations that Meyer looked the other way while one of his assistants was abusing his wife. The “Me Too” movement well might be set to score another “victory” in its effort to eradicate this kind of disgraceful behavior. As ESPN.com has noted, Meyer attained college football greatness leading a team — at the University of Florida — at a time when there was much greater tolerance of players’ misconduct. Read the ESPN story here. The Ohio State story is quite a bit different. It involves an assistant coach Zach Smith, who allegedly was physically assaulting his now former wife, Courtney Smith. Meanwhile, Urban and others knew about it, but took no action. Urban Meyer has been perceived for a long time to be one of the good guys in intercollegiate sports. This story, if it proves true, peels away that veneer more than likely forever. The “Me Too” movement has arisen out of an increasing societal intolerance of abusive behavior of powerful men. It has ended the careers of men in sports, entertainment and politics. As it should! It has, in the case of Bill Cosby, resulted in a criminal conviction. There likely will be others. I don’t want Urban Meyer to be the next one to be given the boot. If the OSU investigation proves that, yes, the head coach knew about sexual abuse involving a staff member but looked away … well, the school will have no choice but to fire him. There can be zero doubt about a couple of things relating to Monday night’s football game to determine the national collegiate champion. * First, the “wrong” team won the game. I am a native of Oregon and I was pulling mightily for the Oregon Ducks to beat the other guys and take a national championship back to the Pacific Northwest. They had me going after the first two possessions of the game. A quick score and then forcing the other guys to punt the ball away. Woe is me and the rest of us who comprise the Duck faithful. * Second, Ohio State’s Buckeyes deserve the honor of being called the national champions of intercollegiate football. Let there also be zero doubt about the Buckeyes’ place in this four-team playoff, the first of its kind established by the NCAA to determine the best football team in the country. My hat — if I were wearing one at the moment — would be off in tribute to the Buckeyes. Man, they played a great football game! Four great teams were selected for this two-round playoff system. Granted, Ohio State was not my pick for the fourth seed; I preferred Baylor or perhaps Texas Christian University for that spot. But as it turned out — much to the dismay of Alabama and now Oregon faithful — the Buckeyes turned out to be more than merely worthy of the honor of participating in the playoff system. The Bowl Championship Series system is history. The bowl games, while important to the schools participating in them, no longer will determine the national champion. The BCS system of selecting the champs was too prone to second-guessing — not that this system didn’t have its share of doubters. However, as we saw last night in Arlington, Texas, the new playoff system allows for the title to be decided by the coaches and athletes. The NCAA football playoff system gurus got it right. Well done.